I picked up this 'baking' pattern paper from our local scrapbooking store several weeks ago, only because I loved the paper. And I finally got a chance to cut it! 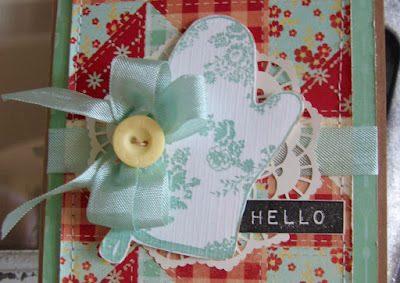 I am entering my card @ Word Art Wednesday, for their Anything Goes challenge. If you haven't played along with this talented group of ladies, you are certainly missing out. 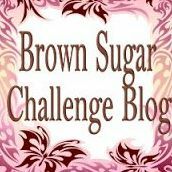 I am also entering my card @ Brown Sugar Challenge, for their Anything Goes challenge, as well. This design team will inspire you! Please stop by and have a look. Recipe: The card is a typical A2 size card: 4 1/4" x 5 1/2". I used my favorite kraft card stock as the base. I love the color and feel of this heavy weight card stock. I used pattern paper from Bo Bunny, Kiss the Cook collection. I just love the colors, the nostalgic patterns, and the beautiful images. It reminds me of a church picnic. Everything homemade, and delicious! I wrapped some mint blue seam binding around the card front. Layered a paper doily from Stampin' Up! on top of the ribbon. I stamped an oven mitt in Mint Macaroon classic ink, by Stampin' Up! onto white linen card stock, by Paper Trey Ink. I used the Country Kitchen stamp set by FarmHouse Paper Co. I fussy cut the mitt out with my scissors. And adhered it to the card front with foam tape. I just love how this linen card stock gives the oven mitt the look of fabric! Tied a multi-loop bow with the seam binding, and tied on a yellow button, to highlight the yellow in the pattern paper. For my sentiment I used the Label Love stamp set by Altenew. I am so loving this stamp set! I stamped the sentiment in basic black classic ink, onto vanilla card stock and fussy cut. I adhered the sentiment bar to the card front with foam tape. Viola! My card isn't loaded with a pound of blossom, or trim, but I still think it looks sweet! I hope you get a chance to create something beautiful and play along with these challenges! I love the quilt background with that cute little oven mitt! 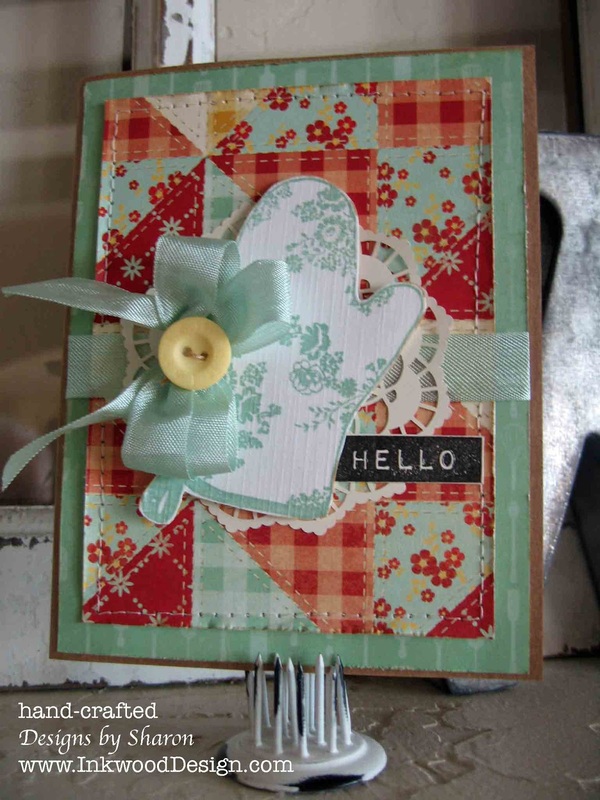 Red and mint are such a great color combo too - beautiful card! This is SO pretty, Sharon. Your cards are really getting more and more interesting with each one. It's so nice to see them linked to our challenge. I thank you for that. Have a blessed week, my creative friend!